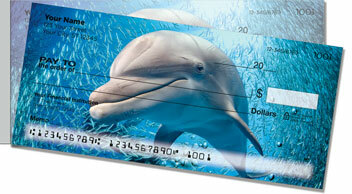 If you love dolphins, you'll flip for the vivid pictures our photographer captured for our Dolphin Side Tear Checks, now available exclusively from CheckAdvantage. 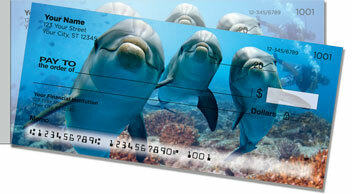 Dolphins are considered highly intelligent and, like humans, they communicate vocally. 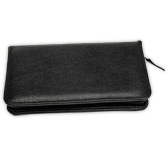 Their "speech" consists of clicking and whistle-like sounds. But one of the most interesting things about dolphins-something that separates them from most other sea creatures-is the fact that they are highly social. Dolphins actually have the empathy to help sick or injured animals by bringing them to the surface to breathe! They've even been seen gathering around human swimmers to protect them from nearby sharks! 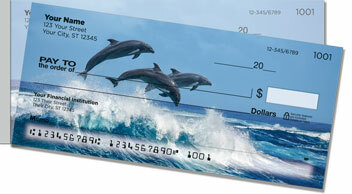 Now you can express your own fascination with dolphins every time you write a check. 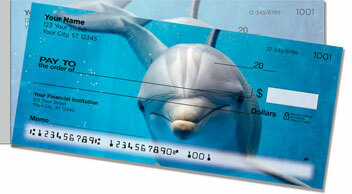 Order your very own Dolphin Side Tear Checks and matching Dolphin Address Labels today!